I know what you are thinking… bacon in croutons? Because I love bacon so much I save the bacon grease to use for other cooking purposes. The other week, I made grilled sausage and pepper subs. I cut out the middles of the sub rolls and saved them to the side. 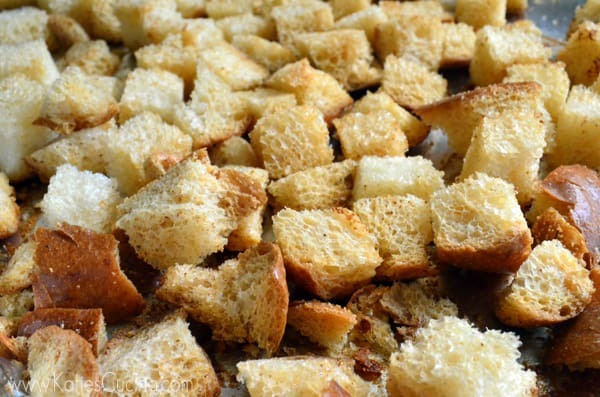 I decided I would make a few croutons out of them instead of wasting the delicious fresh bread. We have been eating a lot of salads in our home. At least one with dinner every night. I had just pulled bacon out of the oven, when I decided to cube the bread and roll it in the leftover bacon grease. For good measure, I sprinkled a little garlic powder on top and popped them in to the oven. Later that night when we went to eat our salads I topped each salad with a few homemade croutons. This is a luxury item for our salads. I never have croutons on hand. I love them and eat them when they are presented on a salad, but its the last thing I think about buying at the store. I will tell you that it was love at first bite–the homemade garlic bacon croutons were amazing. They do not have an overwhelming bacon flavor to them, but just enough to make you think about what is on these croutons. Even my non-bacon loving husband loved the croutons. I didn’t tell him what they were seasoned with until after he was done with his salad, and then when I told him he wasn’t surprised at all. I think he loathes the fact that I keep a small jar of bacon grease in the refrigerator at all times. No wasting in our house is my motto (especially when it comes to bacon). This was definitely a happy accident type of recipe. 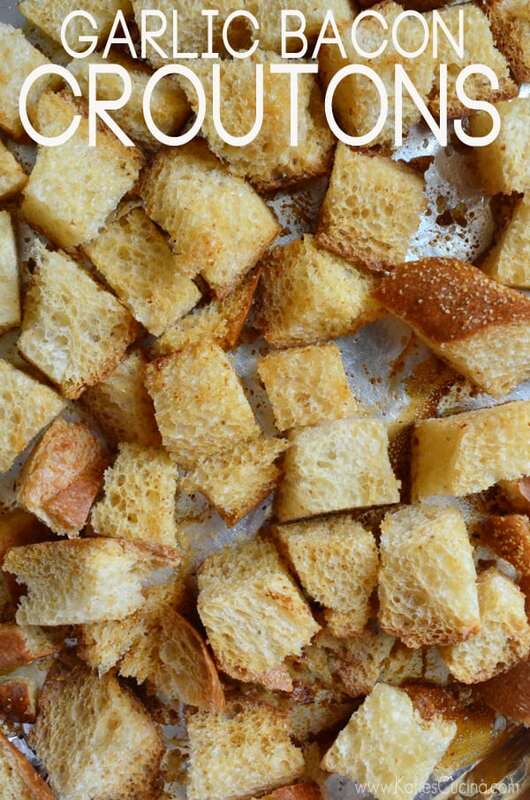 I wasn’t going to blog about it, but after finishing my cup of croutons in less than a day I decided to make more. I finished the two remaining sub rolls and baked them up into beautiful garlic bacon croutons. Every night for the past 2 weeks we have enjoyed them on our salad, and I think once we are done with them I’ll have to invent another new crouton recipe. Croutons are something that you forget is so good until you have them daily. In a frying pan, melt bacon fat if need be then spread on to a tinfoil lined baking sheet. Place cubed bread on baking sheet and rub around in the bacon fat until every piece of bread is coated. Then sprinkle on the garlic powder. Bake for 350 degrees on the middle rack for 10 minutes. Toss the croutons and bake again for an additional 5 minutes until golden brown. Let them cool and then seal in an airtight container for up to 2 weeks. Oh man I could pop a big handful of these into my mouth. Totally admit I have! lol. Thanks Ali! Yes–and best of all it’s semi-free! lol. Love this and love bacon grease! It’s my life. Ha ha glad to know I’m not alone, Karly! You had me at bacon! That’s all it takes to win me over. 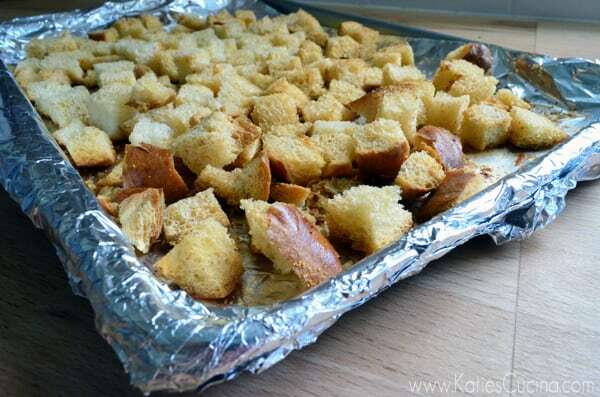 You cannot beat homemade croutons! And I’ve never thought of using bacon grease instead of butter. Brilliant!!! I use bacon grease in almost everything Liz! LOL I’m addicted to the stuff! Forget the salad, I’d TOTALLY eat these for a meal! Umm I have definitely found myself snacking on these bad boys! They are addicting!!! You had me at bacon! Perfect addition to any salad! ha ha I’m the same way. Bacon addict for life! Using bacon grease for croutons is the best!